Whether you need closed toe sandals for work or want some cute options that will cover your less than perfect toes for the summer, there are a lot of great options available. Closed toe styles are great because they hide any non-pedicured toes that you may be self-conscious about, while still keeping your feet fresh. 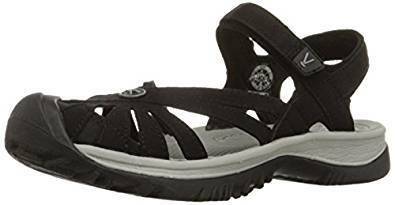 Here are reviews of some of the best-closed toe sandals for a variety of different situations that you may find yourself in during warm weather. 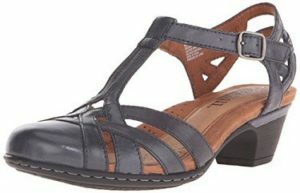 SoftSpots Women’s Tatianna Ankle Strap Huarache Shoes are a great option if you are looking for a dressy shoe for work. These are a great option if you have high arches and need something that won’t kill your feet at work or an event where you may be walking or standing a lot. The support is outstanding on this design, partly because the heel is very stable and there is a substantial amount of padding in the instep. They come in some beautiful summertime colors. 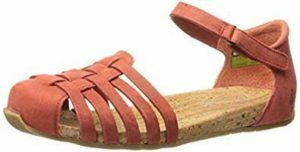 Jambu has a few moderately priced, casual flats that work well as a sandal that can hide your toes. Two of their most popular styles are the Blossom Encore and the Wildflower (pictured above). The Wildflower is a comfortable, versatile style that you can dress up or down and it comes in some modern, beautiful colors. They are vegan, and the outer rubber sole is made from partially recycled rubber and has all terra traction you won’t find yourself slipping in these babies. They are known for keeping your feet cool and dry, and they have adjustable hook and loop straps so you can play around with the fit to make sure you are your most comfortable. The Wildflower runs a little small, so you may have to go up a size if you order it online. 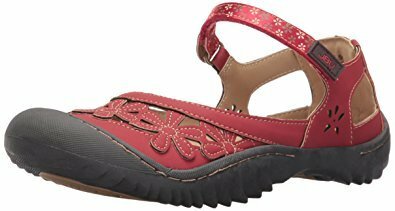 KEEN Women’s Rose Sandal uses Keen’s signature rubber toe bumper which gives them a partial toe covered look that is great for walking or sporty outdoor activities. This design has washable polyester webbing and has a multi-directional lug pattern if you are going to be wearing them for situations where you need a lot of traction. The footbed is designed to provide the best kind of support for your feet with an emphasis on the first metatarsal joint. If you have high arches, they may not be the best choice for you since they have a low to moderate arch support. This design has a relatively flat heel (1.25″) making them a great option if you are doing a lot of walking. These are not water shoes like some other Keen designs. If you are worried about odor control, they do have the AEGIS Microbe Shield lining that will cut down on any build-up of odor-causing bacteria. The versatile Rockport Cobb Hill Collection has a couple of great closed toe options. The Aubrey (pictured above) is a beautiful style, particularly as a work option. 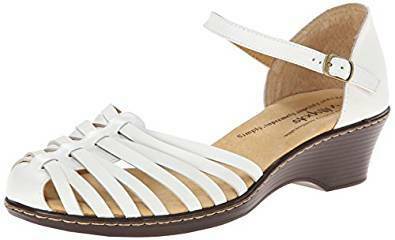 If you prefer a flat take a look at their Ireland Fisherman sandal, that is also very popular. The Aubrey has excellent support if you are looking for a shoe that will work well if you are on your feet all day, but still need to look dressy. They are burnished leather, they come in 8 different colors, and they have a slightly retro look to them because of the t-strap. It has a comfortable 1.5″ mid-height heel, that looks a little bulky, but is pretty lightweight. The footbed is Eva foam that is effective padding to use shoes for comfort. Noat shoes are known for their comfort, flexibility and good arch support. The company makes its products in Northern Israel. They are a bit on the pricey side, but if you have foot issues, they are well worth the investment. They come with a removable footbed, so you can insert orthotics if needed. You can also replace the footbed once your current one wears out, extending the life of your sandal. 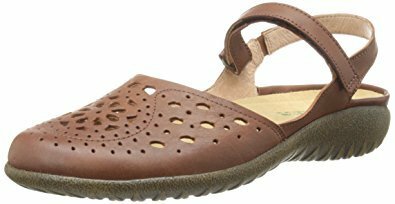 The footbed is the key to the comfort of this brand; it is a blend of natural latex and cork covered in suede. The Arataki Dress Sandal is very cute and can be dressed up or down depending on the occasion. Naot shoes generally don’t need to be broken in and tend to be comfortable right from the start. If you have a narrow foot, this may not be the right style for you. 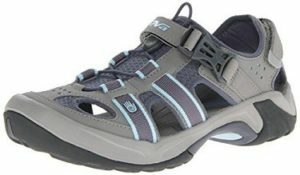 If you are looking for an outdoor toe covered sandal for hiking, a good option is the Teva Omnium. This style is a shoe sandal cross. It has all of the support and traction of hiking or walking shoes as well as the openings on the sides to keep your feet cool in the summer. They have a quick-drying, breathable upper fabric, which is great because it makes them quite versatile for all kinds of different types of actives including those where your feet may get wet. This design has a quick release buckle, so you don’t have to deal with a Velcro strap. It also has two other points of adjustability to help you get the best fit. If you are worried about comfort, the footbed has a molded EVA midsole and Shoc Pad heel so this shoe can take some pretty rough treatment and still be comfortable. The Malini from Ahnu is a beautiful all-around style that can work well in many different situations. They are cute, lightweight and very flexible. The upper part of the shoe is soft, nubuck leather, with a breathable closed-toe design that has an adjustable hook and loop ankle strap. The midsole has lightweight EVA cushioning that is designed for comfort, and the footbed is a cork wrapped surface that has gone through an AEGIS antimicrobial treatment. Cork is a great feature to have in footwear because it functions as a natural antimicrobial to stop the footbed from smelling. If you are looking for a comfortable summer shoe that will hide your toes while also keeping your feet fresh, you could try these hemp slip-on’s from Sanuk. They are made of hemp and are vegan and vegetarian. They are super comfortable, look great, and the hemp works as a breathable fabric so your feet shouldn’t get too hot. If your feet do end up sweating, you can machine wash this design, just don’t put them in the dryer because they will shrink. If you need a lot of arch support, this is probably not the shoe for you. They may be a bit of a tight fit when you first put them on, but they stretch to fit your feet. Sizing – Unfortunately, the sizing for different brands can vary quite a bit, so if you want to get the most comfortable option, it is worth researching reviews to see if the design fits true to size. It is especially important if you are ordering online. Cleaning– Sometimes sandals can take a bit of a beating in the summer. You face things like sweat, dirt, and water getting into the inner part of the shoe, much more than you do with cold weather footwear. All of these things can lead to bacteria causing an odor that will shorten the life of your shoes. If you are buying an outdoor activity sandal like a Keen or Teva, check for instructions on how to clean it. Some designs can even be machine washed, which is nice if the shoes have gotten wet and smelly. The material of the Footbed– If you are looking for a style that is going to be comfortable, you will want to look for a footbed that is either cork or has EVA contained in it. Cork is great because it works well for shock absorption, while EVA is a dense foam that is also great for shock absorption. If your feet tend to sweat, you may want to look for a footbed that is moisture-wicking (such as suede). Durability– Sandals can be the flimsiest of shoe styles. If you are looking for something that can last for years, look for thicker straps, good quality Velcro, rubber soles with traction, a cork footbed, leather or a washable material, and styles that have had an Aegis antimicrobial treatment. Odor Control– Those who have problems with odor in their footwear may want to look for designs that feature antimicrobial treatments (Aegis is the most common). They will help minimize odor-causing bacteria and extend the life of your sandals. Sole – A big problem with inexpensive styles is that they come with no grip or traction. If you find yourself caught in a summer rainstorm in a pair of cheap, no traction sandals you will know how slippery they can become. There are lots of styles that have rubber soles that have a type of grip rubber that will help with traction. Waterproof– Depending on what type of activities you are wearing your footwear for, you may want to look for waterproof or water-resistant materials in case you get them wet in the rain or during water activities. Many designs are water resistant, not waterproof. Arch support– Generally summer shoes aren’t known for having great arch support. Some of the designs that we have listed above that are good if you have high arches include the Comfortiva Tatianna, Arataki Dress Sandal and the Rockport Aubrey. Adjustable ankle strap –If you have difficulty finding a style that fits properly, a useful feature to look for is a design with an adjustable ankle strap. It will give you a little more ability to adjust the fit to the shape of your foot.